Today we have collected some great html5 template deals from the best deal for designers websites. An html5 template is a great starting resource if you are working on a web project. There is nothing more difficult for a web designer than starting a project for a blank page. That’s why design inspiration are so important for graphic project and at the same time html5 template are so important for web design project. Of course It is also important to have an html5 template that represents a good starting point for your project. The web is full of html template but if you give some of them a deeper look you’ll find that many are very poor. Many are fixed and only offer an homepage and sometimes one internal page or two. That’s way we have collected the following great html5 template deals with premium templates with lots of options and flexibility to boost your next project. Enjoy! Arctic: Responsive Multipurpose HTML5 Template Deal – only $9! 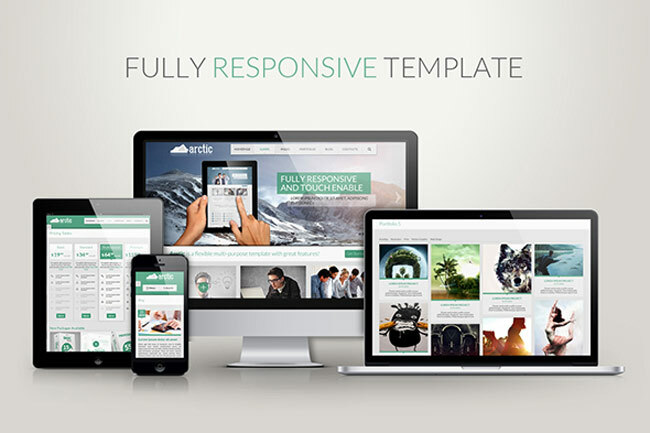 Arctic is a multipurpose responsive HTML5 template. With several different and distinct pages, above 20 custom made pages, a variety of sliders, 4 layered as well as well-organized PSD files, along with a slew of interactive tools and widgets, Arctic can just about do it all. You heard that right, you can really save almost 50% off this stunning template! In this bundle you will find great resources for your next project. Responsive landing pages, coming soon pages, email templates and not only! All those items have a clean html code so that they can be easily edited and modified. If you need a little help – you will find an extensive documentation for each template! As you are already used to, all these resources come with a multi-use license, allowing you to use them in an unlimited number of personal and commercial purposes! This all new time-limited HTML5 Template bundle contains brand new HTML5 Templates from FWD along with some of the most popular FWD items to date with incredible value! That’s 18 Incredible HTML5 Templates including multiple photo galleries, zoom and pan tools, 3D carousels & coverflow galleries, dock menu, 360° product viewer and more! These items come all bundled together at an amazing low price!